The importance of regular effective dental care for horses cannot be over emphasised. We use the powerfloat tool in combination with hand instruments to provide routine dental floating through to advanced corrective dentistry. 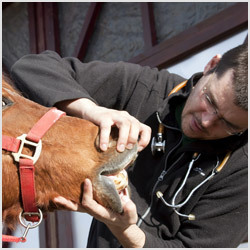 Our vets have undertaken further training in equine dentistry, ensuring your horse’s teeth are in good hands. We offer routine and corrective dental work as well as surgical procedures such as tooth removals, drainage of sinus infections and deciduous tooth extractions. All procedures are carried out under sedation and analgesia so your horse remains calm and comfortable. Results are often seen immediately with improved performance and weight gain - and a happy horse! Call us for more information or to book a veterinary visit 4959 2099.